Received December 3, 2015; Accepted December 6, 2015.; Published online January 25, 2016. Indeed, the two existing genetically encoded H2O2 probes, HyPer and roGFP2-Orp1, are based on OxyR and Orp1, respectively (Bilan and Belousov, 2015; Schwarzlander et al., 2015). 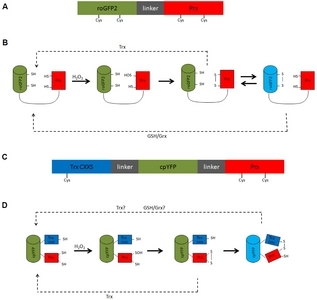 OxyR is a H2O2-sensing transcription factor from bacteria and Orp1 is a member of the glutathione peroxidase family from yeast. Both proteins have a rate constant for the reaction with H2O2 of approximately 105 M?1s?1 (Aslund et al., 1999). However, peroxiredoxins have a significantly higher reactivity towards H2O2 which can be as high as 107 ? 108 M?1 s?1 (Rhee and Woo, 2011). This potentially makes them superior H2O2 sensors. Indeed, a side by side comparison between endogenous Prx2 and ectopic roGFP2-Orp1 in mammalian cells showed that Prx2 is many times more sensitive than Orp1 (Sobotta et al., 2013). Nevertheless, little has been done to develop biosensors based on Prx. In the following we will address the question of whether such probes can be developed. Genetically encoded Prx-based H2O2 probes will necessarily consist of (at least) two moieties. The first moiety is the Prxs domain and the second a fluorescent reporter protein. In currently used genetically encoded redox probes the fluorescent reporter is either circularly permutated yellow fluorescent protein (cpYFP) or redox-sensitive green fluorescent protein (roGFP) (Fig. 1). The cpYFP reporter responds to a structural perturbation, whereas the roGFP reporter responds to the oxidation of its cysteine pair to a disulfide bridge (Bilan and Belousov, 2015; Schwarzlander et al., 2015). Another potential strategy is the use of a F?rster resonance energy transfer (FRET) pair of two fluorescent proteins to sense structural changes imposed by the oxidation of the peroxiredoxin (Barranco-Medina et al., 2009). Thus, based on existing probes at least three different designs can be envisaged. The envisaged Prx-based biosensors promise to achieve much higher sensitivity than the current generation of genetically encoded H2O2 sensors (Ezerina et al., 2014). However, peroxiredoxins exhibit rather complex biochemical and structural behavior (Rhee and Woo, 2011; Perkins et al., 2015). This may complicate or compromise their utilization as H2O2 sensors. In the following we discuss these complexities and how they may affect probe behavior. For simplicity, we focus our discussion on roGFP-Prx fusion proteins, but most considerations equally apply to the other design strategies. Fig. 1. The H2O2 sensing mechanism of HyPer (A) and roGFP2-Orp1 (B). The sensing moieties of both probes (OxyR and Orp1 respectively) are colored in red and the fluorescent reporter moiety (i.e. cpYFP and roGFP2) in green or blue. (A) HyPer consists of a cpYFP fused to two halves of the OxyR regulatory domain. Upon the reaction of OxyR with H2O2, an intramolecular disulfide is formed which triggers a conformational change and thus modifies the fluorescence of cpYFP. (B) The roGFP2-Orp1 probe senses H2O2 via Orp1. An intramolecular disulfide is formed in Orp1 which is transferred to roGFP2 by thiol-disulfide exchange. The introduction of the disulfide into roGFP2 changes its fluorescence. Both probes are reversible in cellulo due to the reduction by glutathione/glutaredoxin(GSH/Grx) and/or thioredoxin(Trx) (dashed lines). Fig. 2. Example designs for a roGFP-based (A, B) and a cpYFP-based Prx probe (C, D). Schematic representation of the roGFP-Prx probe (A), and Trx(CXXS)-cpYFP-Prx probe (C) with the reporter moiety in green, flexible linkers in grey and the Prx moiety in red. The Trx moiety lacking its resolving cysteine in the Trx(CXXS)-cpYFP-Prx probe is shown in blue. Cysteine residues involved in the reaction mechanism are denoted. (B, D) Hypothetical reaction scheme of the suggested probes. For simplicity, both schemes are based on a monomeric atypical 2-Cys Prx. Howerer, similar schemes apply to dimeric typical 2-Cys Prxs. Possible reduction pathways are indicated. Fig. 3. 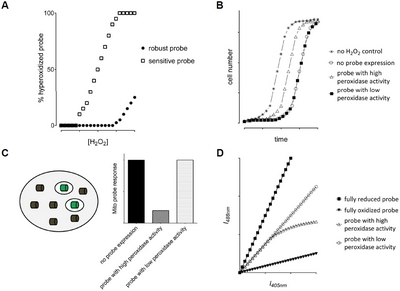 Strategies to investigate hyperoxidation sensitivity (A) and physiological impact (B?D) of Prx-based sensors. (A) The fraction of hyper-oxidized probe as a function of the applied H2O2 concentration is determined by hyperoxidation-specific immunoblotting. (B) A growth recovery experiment can be used to determine the influence of the probe expression on cell growth and survival. A theoretical growth curve upon treatment with sublethal concentrations of H2O2 is shown for probes with and without a physiological impact. (C) Investigating the influence of a probe on H2O2 scavenging capacity. A non-fluorescent probe version (grey cylinder) is expressed in the cytosol and its impact on H2O2 homeostasis is measured using a fluorescent probe (green cylinders) expressed in mitochondria. A theoretical result is shown on the right for probes with and without an impact on H2O2 homeostasis. (D) Expected fluorescence intensity scatter plots for a ratiometric probe with low (open circles) and high H2O2 scavenging activity (open triangles). Seidel, T., Seefeldt, B., Sauer, M., and Dietz, K.J. (2010). In vivo analysis of the 2-Cys peroxiredoxin oligomeric state by two?step FRET. J. Biotechnol.. 149, 272-279.